Today is the 56th anniversary of the momentous day in 1959 when the Tibetan people rose in a peaceful, spontaneous uprising for freedom and to protest the oppression of communist China in Tibet’s capital Lhasa. It is also the Tibetan Martyrs’ Day, dedicated to the patriotism of the heroic men and women of Tibet. On behalf of the Tibetan Parliament in Exile, I would like to commemorate with great ferventness the patriotic men and women of Tibet who had sacrificed their all, including their very lives, for the religion, polity and people of Tibet, and to express solidarity with those who continue even today to suffer oppression and torture under the policy of violent repression of the communist party government of China. Immediately after establishing the so-called People’s Republic of China in 1949, the communist Chinese government entertained an ambition to gobble up Tibet in its entirety, including the land and people of this ancient Snowland. With this end in view, it launched an armed invasion through successive onslaughts through the borders of all the Three Provinces of Tibet. It resulted in hundreds of thousands of Tibetans being killed. Besides, the invading Chinese devised a plot which posed an imminent danger to the life of Tibet’s supreme temporal and spiritual leader, His Holiness the Dalai Lama. It was when the Chinese were on the point of carrying out this diabolical plot that on 10th March 1959, thousands of Tibetans rose in a spontaneous protest demonstration across the Lhasa city, targeting the communist government of China and the Chinese occupying forces. This is indelibly etched in the history of Tibet as a vital evidence of the events of that time. While it remained in occupation of Tibet, the communist government of China resorted to distortion of Tibet’s history and its sovereignty. It took to amalgamating Tibet’s culture with its own despite the fact that the two were entirely incompatible, thereby seeking to destroy its unique identity. It deprived the Tibetan people of their religious faith and freedom. It vandalized and recklessly exploited Tibet’s territory and its resources, thereby setting out to destroy the environment of the Tibetan Plateau. It trampled on the Tibetan people’s rights as human beings and put an end to the Tibetan people’s freedom of speech. In the name of economic development, it carried out vicious colonial practices. It sought to destroy the ethnic integrity of the Tibetan people by splitting them up. And it treated with contempt the aspirations of the Tibetan people. Apart from carrying out a litany of such abuses, China has never implemented in Tibet a policy that genuinely addressed in a meaningful manner the real conditions there. Rather, it invariably adhered to a policy of violence and brutality. Because of this vicious policy, there has never been a period through generations both old and new when peaceful Tibetan protests against Chinese rule ever came to an end. The Chinese leadership should understand that it is impossible for the peaceful Tibetan protests to come to an end so long as there is no just resolution of the issue of Tibet. Since assuming the temporal and spiritual leadership of the Snowland of Tibet, His Holiness the Great 14th Dalai Lama has taken a series of initiatives designed to reach a settlement on the Sino-Tibetan dispute, keeping in mind the interests of Tibetans both in Tibet and in exile. His outstanding efforts directed at reaching a just solution to the issue of Tibet has been well recognized by the international community which honoured him with more than a hundred prestigious awards, including the Nobel Peace Prize. Nevertheless, successive leaderships of China have invariably taken recourse to nothing but subterfuge, never even remaining true to their own words. Apart from numerous other breaches of faith, they did not respect even the so-called 17-Point Agreement which was entirely dictated by them and which they forced the Tibetan side to sign at the point of their gun. After putting the entire blame for all the excesses of the Cultural Revolution on the Gang of Four, China began implementing the so-called policies of opening up and liberalization. However, these were only in name when it came to Tibet, for it has never, thus far, implemented any policy there that is in any substantive way beneficial to the local Tibetan people. It was therefore not surprising that in 1987 the second generation of Tibetans who were said to have been nurtured and brought up under the Red Flag of China and in 2008 the third and so on led protests which were widespread and took place on successive occasions in all the three traditional provinces of Tibet, including in the city of Lhasa. In particular, available information suggests that from 2009 to 5th March, 2015, a total of 136 Tibetans immolated themselves in acts of protest against Chinese rule. Of them 117 were known to have died. Developments and incidents such as these shows that Tibet, which was once a religiously endowed land of peace and tranquility has now become something like a slaughterhouse, filled with weapons of violence and bloodshed. The basis for this is, of course, the policy of violent repression pursued by the government of China and the attitude of the Chinese government leaders. The communist Chinese government’s policy of violent repression has led to the death of more than 1.2 million Tibetans. Besides, the tragedy of the situation in Tibet today is such that it still remains impossible for anyone to estimate how many Tibetans still remain imprisoned and suffer torture of such severity as a hell on earth. Since 1959, governments, parliaments, non-governmental organizations and numerous other bodies and leaders across the world have held discussions and passed a series of resolutions on the just cause of the Tibetan people, as well as provided economic assistance and so on. These have been of invaluable fraternal help towards the internationalization of the issue of Tibet and our gratitude to them for their support for our just cause remain limitless. Nevertheless, in substantive terms, the main responsibility for achieving a solution to the just cause lies with the Tibetan people ourselves and we must rise to the challenge of discharging it. No cause remains to issue any further urging when it comes to talking about the courage and determination shown by the Tibetan people inside Tibet. Including His Holiness the Dalai Lama, most of the top leaders of the four great schools of Tibetan Buddhism and of the Yungdrung Bon religion as well as many others who had carried out temporal and spiritual leadership roles in Tibet managed to escape into exile. In order to be able to preserve, defend and spread the substance of the Tibetan religious traditions and Tibetan culture in the free foreign countries and places, including India, institutions such as the Central Tibetan Administration, complete with the three pillars of democracy were established. Settlements providing safe and secure homes for Tibetans living in exile were built. And flourishing religious centres complete in all respect as places for carrying out prayer services, engaging in practices and imparting religious education, were established. Publicity efforts were made to raise awareness about and understanding of the just cause of the Tibetan people while both modern education and traditional knowledge were imparted to all the Tibetan youngsters living in exile. In such ways it was ensured that, unlike any other community of political refugees across the world, the Tibetan people stood out with excellent accomplishments both religiously and politically. Nevertheless, the new generation of today must prove itself up to the task of carrying forward the accomplishments and aims of the older generation. All sections of the Tibetan people must therefore make concerted efforts by assuming responsibilities in an all-round manner and without any shortcoming. In particular, it must be understood that the most important essence of the life of a people is its linguistic culture, both spoken and written. All the young Tibetans in exile in general, and especially the Tibetans youngsters growing up in Western countries, must make special efforts in learning the Tibetan language and script. Otherwise, there is a real big danger of facing a situation where Tibetans do not know their own language. We must look up to the young Tibetans in Tibet for the kind of efforts they are making towards protecting the Tibetan linguistic heritage under the violent repression of the Chinese government. It is important for us to make efforts to ensure that we do not become Tibetans who are ashamed to call ourselves Tibetan. While ruling the country over the past several years, the new leaders of China have been contending that in order to govern China, the border areas should be governed well; that for the purpose of administering the border areas properly, stability must be ensured in the Tibetan regions. Through the use of such remarks, tens of thousands of Chinese officials were sent as work teams to all the Tibetan inhabited areas, including in the Tibet Autonomous Region. Such team members took up long-term residence within the Tibetan communities, including in the monasteries, and began carrying out surveillance on the activities of the local Tibetans day and night. In doing so, they harassed the monastic communities by rendering them unable to devote their times to prayer services and religious studies. They began exercising tight controls and restrictions on the local Tibetan people’s political rights, freedom of speech, their day-to-day occupational pursuits, their freedom of movement, and so on. This situation continues even today. In addition, using its ongoing anti-corruption campaign, China has also been making all kinds of criminal accusations against many Tibetans for such alleged violations as being followers of the so-called “Dalai separatist clique”. Subjected to such diverse kinds of harassment and persecution, Tibetans are deprived of all freedom to campaign for anything connected with their just cause. The situation in Tibet continued to remain grave and tragic in 2014, leading to continued protests, including through self-immolations, by the Tibetan people. There was also no let up in China’s reckless exploitation of Tibet’s mineral resources and the destruction of the environment. Not a week passed without there being at least one arrest or imprisonment of a Tibetan. The actual history of Tibet continued to be distorted in documentaries shown over state television channels. Tibetans were executed by being fired on by special armed security forces. The prevalence of gross inequitable treatment, including through ethnic discrimination, in this so-called great Chinese motherland ensured that achieving stability in the Tibetan areas was virtually impossible. Also, in their reports in 2014, many international human rights monitoring organizations explained that the situation in Tibet had continued to remain critical. Given this background, we would again like to make an emphatic call on the Chinese leadership to implement a policy of seeking truth from facts and of being true to their own words in addressing the situation in Tibet. It is also important that we the Tibetan people living in exile should continue to carry out campaigns without any let up in connection with the issue of Tibet. It was with this understanding that during 2014, members of the Tibetan Parliament in Exile, including the Speaker and Deputy Speaker, were divided into groups and travelled to many countries both in the East and West to meet with political leaders, including parliament members, and prominent public figures. They briefed those leaders and influential public figures with information about the critical situation in Tibet today, including on the continuing incidents of protest self-immolations. These visits and meetings also included making efforts and presenting a range of appeals to garner support for the Tibetan issue and yielded appreciable results. In particular, members of the Tibetan Parliament in Exile met with more than 100 lawmakers who had just recently got elected to the 16th Lok Sabha, or Lower House, of the Indian Parliament, and successfully lobbied for the re-launch of the All-Party Indian Parliamentary Forum for Tibet, the Tibet Support Group in the Indian Parliament, and it has already begun its work. There is absolutely no change in our resolve to seek a negotiated solution through the middle way approach, which is mutually beneficial to China and Tibet, as a part of our efforts to resolve the current critical situation in Tibet and the wider issue of Tibet. We would therefore like to reiterate our call on the leadership of the People’s Republic of China to give up engaging in a blame game and, instead, make use of the opportune moment today to enter into a peaceful Sino-Tibetan negotiation with the urgency the issue deserves. 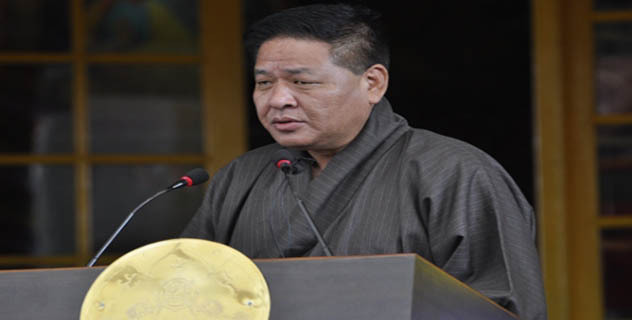 I would also like to take this opportunity to express immense gratitude to the countries, organizations, and private individuals – including especially the government and people of India – who have been extremely kind in giving support on the issue of Tibet and in providing humanitarian and other forms of assistance to the Tibetan people living in exile. Finally, as we are all aware, the Kashag of the Central Tibetan Administration had declared 2014 as the year for remembering the gratitude we owe to His Holiness the Dalai Lama. Therefore, the Tibetan Parliament in Exile also takes this opportunity to express immense gratitude for every bit of the infinite concerns His Holiness the Dalai Lama has shown and the deeds he has accomplished for the benefit of the Buddhist faith as well as all sentient beings. And we again pray with single-minded devotion that the lord of the entire corpus of the Buddhist faith and sentient beings of the three realms remain steadfast in continuing to live for a hundred eons.